In A Long Way Down, we are introduced to four people, strangers to each other, who meet on New Year's Eve on the roof of a tall building which is notorious for the purupose they are all there for: to jump to their deaths. Jess, a rebellious teenager, was absolutely insufferable. The world would be a better place without someone like her. Martin, a middle aged former morning show host, was a complete degenerate, but at least he expressed the desire to want to be something better. Maureen was an older woman, who was a real downer to be around. Yes, she had a valid reason for being such a downer, but combined with the fact that she was Catholic and took the whole Catholic guilt thing to extremes make for someone who would be difficult to tolerate for very long. Mercifully, she did gradually lighten up. And lastly, there was JJ, a depressed American musician, who in my opinion got lost in the shuffle. 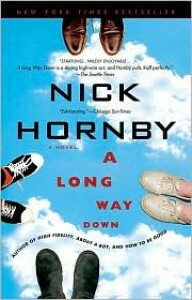 I have found Nick Hornby to be a very hit and miss type of writer. I either like his writing, or I don't. However, this is the first book of his that I have both liked and disliked at the same time. Overall, I think the like outweighs the dislike, but only time will tell if I continue to feel this way a month, or even a year from now. Although I admire his ability to voice four such different personalities, making the alternating first person narration believeable, I couldn't get past the fact that I absolutely couldn't stand Jess, and often also frequently disliked or was annoyed with Martin and Maureen. I realize that was Mr. Hornby's intention, but perhaps he succeeded a little to well. At least these characters realized they were flawed, and they did put forth some effort (albiet rather feebly) to become something other than what they were. Ultimately, the hope for change is what tipped the scale in favor of like.